The month of February means to me getting in touch with as many chocolate sweets as I can! I don’t necessarily go crazy for chocolate sweets. I am aware that I am not the norm…a sort of anomaly. 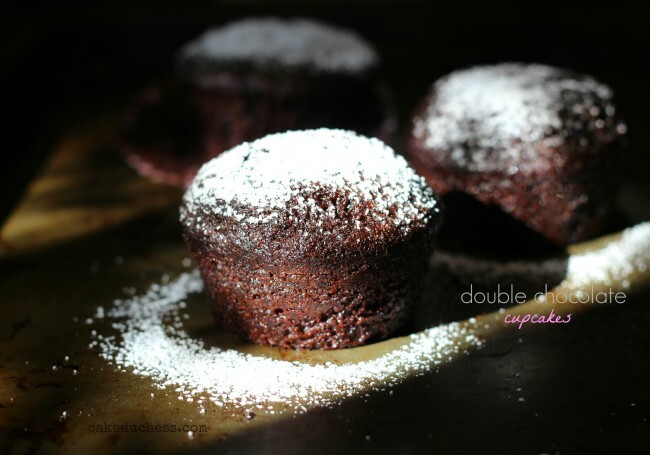 But take these double chocolate cupcakes…these tempt me a little! They are rich and so easy to make. Seriously, there is no excuse to not want to indulge a little in chocolate when these are around. For example, just now I had one for breakfast. With the light dusting of confectioner’s sugar, they aren’t too sweet and went wonderfully with my espresso. Actually, I will add a dash of espresso to the next batch!! Chocolate and coffee, yes! Although I once had a heated debate with someone about chocolate and coffee. They claimed that chocolate should be left in its purest state. Do not mix it with coffee, caramel, or GOD FORBID: MINT!! I had to defend chocolate and caramel…come on!?! That is just a magical combination! And chocolate and coffee: divine! So my kids had a cupcake urge late yesterday afternoon. My daughter dragged out from the baking supply cabinet these adorable Oh, la la cupcake liners with the French poodles to decorate on top. She found some background papers I bought a couple years back when I used to try to make my photos look cute and trendy with some pops of color. She took some photos for me (the ones that are below). I felt bad for her as it was getting darker and I don’t have any fancy lighting. I rely on Florida’s glorious natural light. This morning I had plenty of just that: glorious natural light! I dusted some confectioner’s sugar on a few and snapped some shots for you to see that these cupcakes are even quite perfect without any glaze or frosting. I prefer things on the less sweet side. Are you craving chocolate…today??? Go ahead, check your cabinets. You probably have all the ingredients to make these cupcakes. I used dark chocolate chips and a little bit of dark cocoa powder (hence, the very dark color). You don’t have to use fancy French polka dotted liners like we did. Any liner will do just fine! The best part of this recipe? You can mix the ingredients together all in one bowl. The perfect recipe to do with your kids!! This is a recipe I’ve used for years from Martha Stewart. You can use the chocolate frosting recipe I shared here. Or this fluffy white icing (marshmallow frosting). Preheat oven to 350 degrees. Line standard muffin tins with paper liners; set aside. Sift together cocoa powder, flour, sugar, baking soda, baking powder, and salt into a large bowl. In a small bowl, whisk together the confectioners’ sugar and the milk; add more sugar if needed to thicken it. Drizzle on the glaze. Add sprinkles if you’d like! 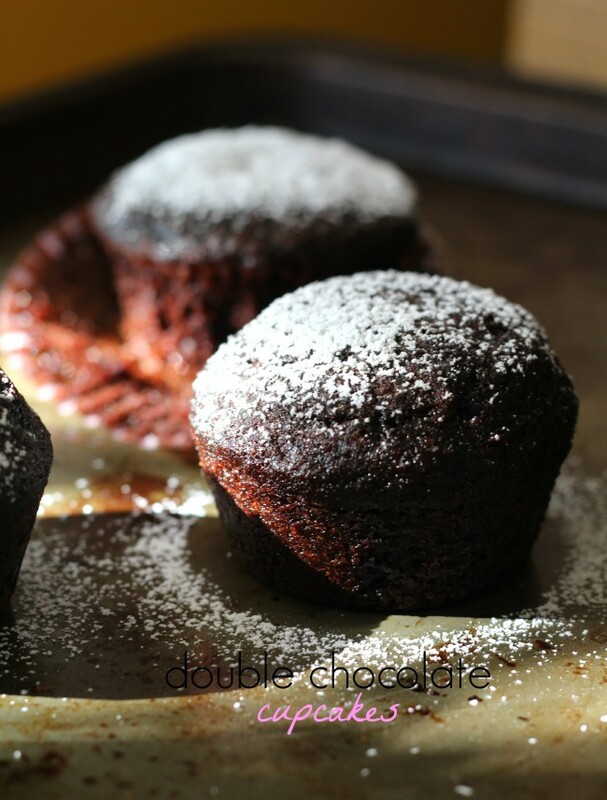 Double chocolate cupcakes sound like heaven to me! 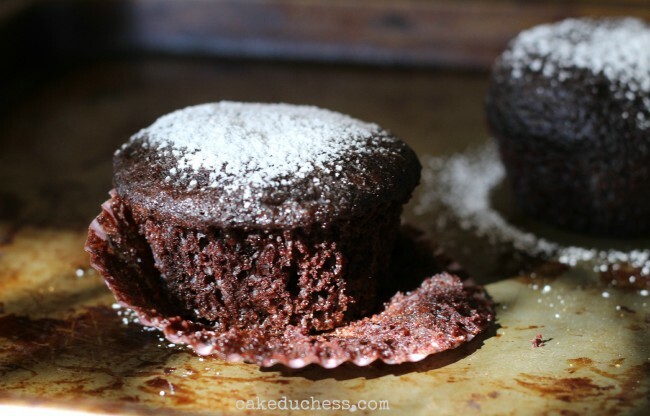 Yes, February is all about chocolate, and these cupcakes are that!! Who are these people who don't like chocolate w/ mint/coffee/caramel?! Crazy talk! I'll take my chocolate with any of those flavours but especially doubt chocolate, like these perfect cupcakes! They look so incredibly moist and light, Lora. 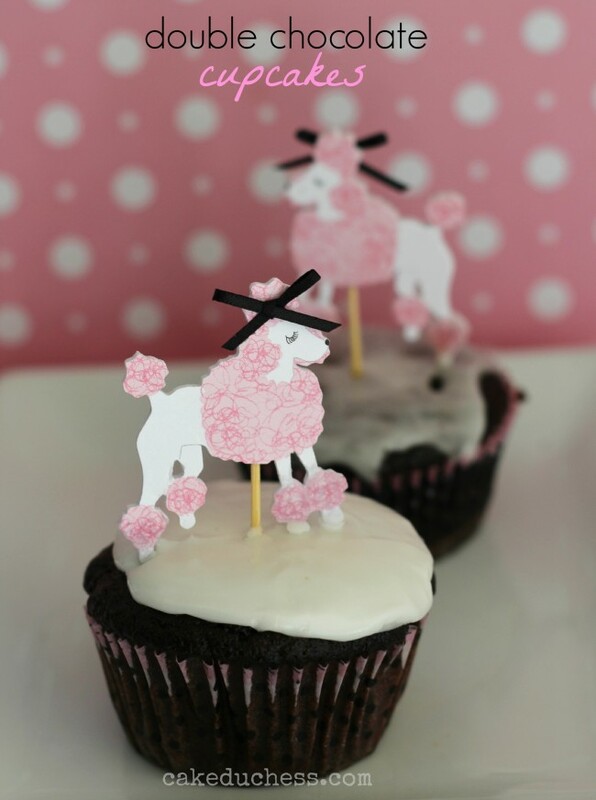 Your cupcake liners and the French poodle are adorable. These are gorgeous photos and I'm loving that natural Florida light! WHAT? Who ever said not to mix caramel with chocolate was a crazy pants! haha I love these with the powered sugar and with the glaze! Ps. Those poodles are ADORABLE! I love those little poodle toppers! Absolutely adorable! While I don't drink coffee, I generally add just a touch of instant espresso to my chocolate desserts. You can hardly taste it but it really brings out the flavor of chocolate. Those naysers don't know what they are talking about. It isn't about the coffee flavor but intensifying the chocolate flavor! Pass these cupcakes my or any others with additional flavoring! Mmm! This post have ME a chocolate craving! With or without the glaze they look delicious either way! 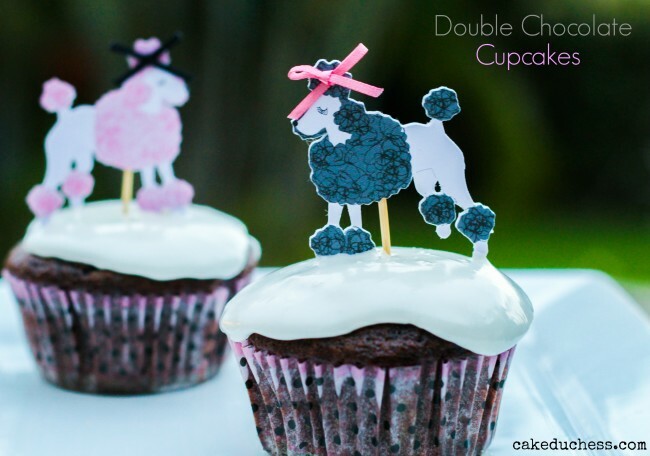 Those poodle cake toppers are too cute! And I agree with you – whoever says no to chocolate and caramel or chocolate and coffee is off their rocker!